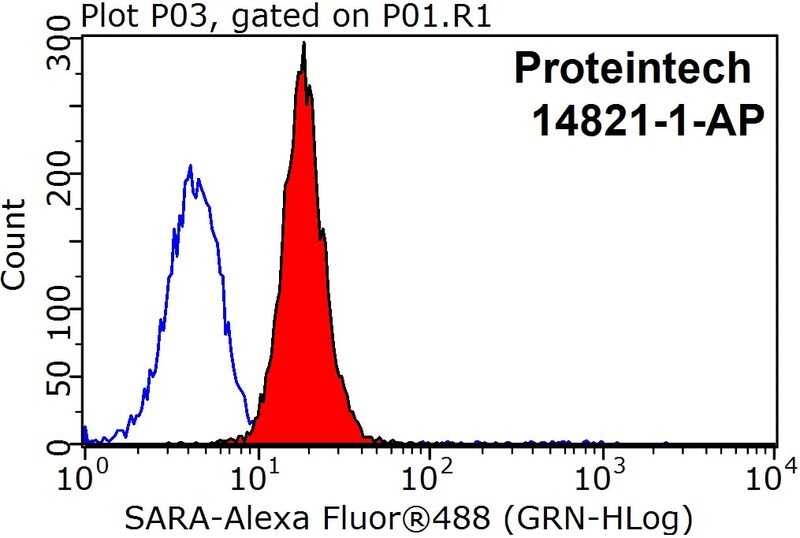 IP Result of anti-SARA (IP:14821-1-AP, 5ug; Detection:14821-1-AP 1:500) with mouse brain tissue lysate 4000ug. 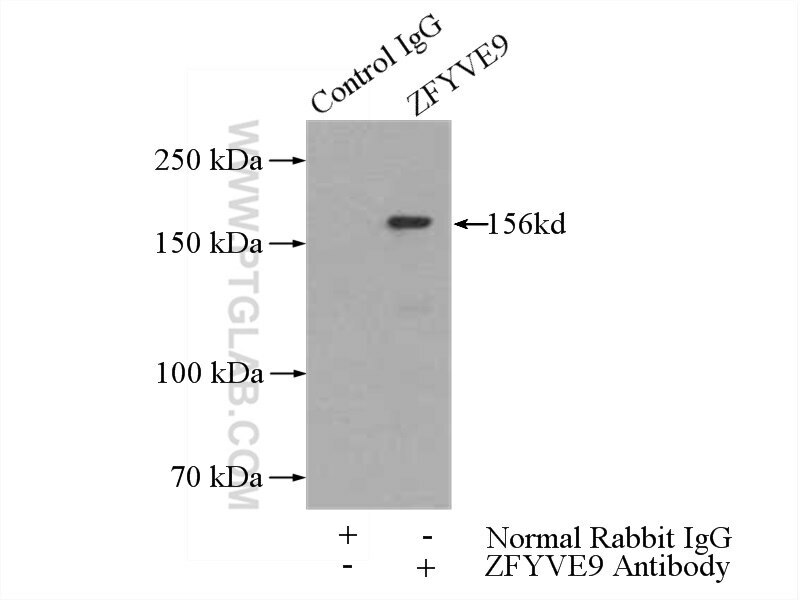 Immunofluorescent analysis of HepG2 cells, using ZFYVE9 antibody 14821-1-AP at 1:25 dilution and Rhodamine-labeled goat anti-rabbit IgG (red). Blue pseudocolor = DAPI (fluorescent DNA dye). 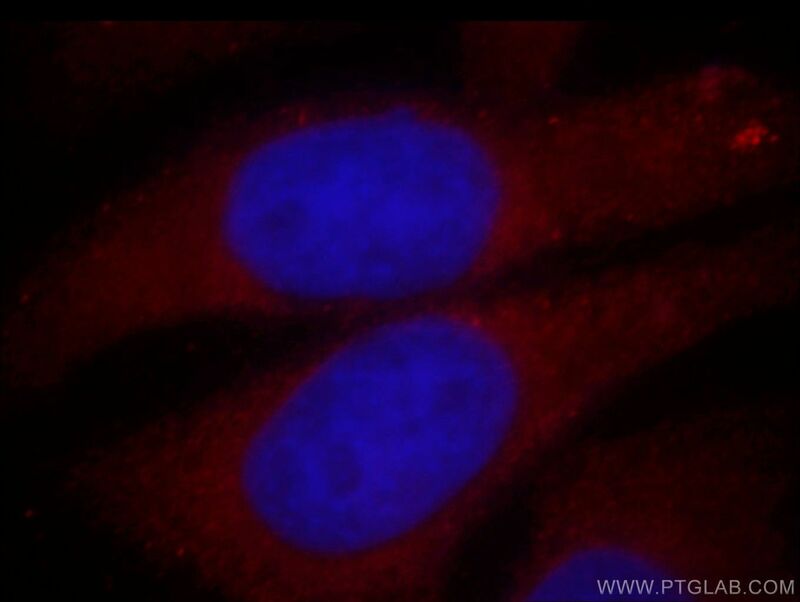 1X10^6 HepG2 cells were stained with 0.2ug SARA antibody (14821-1-AP, red) and control antibody (blue). Fixed with 90% MeOH blocked with 3% BSA (30 min). Alexa Fluor 488-conjugated AffiniPure Goat Anti-Rabbit IgG(H+L) with dilution 1:1500. ZFYVE9, also known as SARA (Smad anchor for receptor activation), is a double zinc finger (FYVE domain) protein that interacts directly with SMAD2 and SMAD3, and is involved in Alzheimer's disease. SARA functions to recruit SMAD2/SMAD3 to intracellular membranes and to the TGF-beta receptor. SARA plays a significant role in TGF-mediated signaling by regulating the subcellular location of SMAD2 and SMAD3 and modulating the transcriptional activity of the SMAD3/SMAD4 complex. SARA is possibly associated with TGF-beta receptor internalization. WDR81 regulates adult hippocampal neurogenesis through endosomal SARA-TGFβ signaling. Dachshund Depletion Disrupts Mammary Gland Development and Diverts the Composition of the Mammary Gland Progenitor Pool. Phosphatidylinositol 3-kinase and Rab5 GTPase inversely regulate the Smad anchor for receptor activation (SARA) protein independently of transforming growth factor-β1.